Last year in late spring, with the tiresome cold of a northern European winter having driven us to the point of madness, Manuel and I made an impulsive decision to spend a week in Turkey. It was really just luck that brought us to this destination, as we would have gone practically anywhere with sun and a place to lie supine beneath it, but a particularly good last minute deal to this country we had both been long eager to visit practically fell into our laps, and before we even had a chance to think twice, we had packed our bags and hopped on a plane. Our itinerary took us to the southwest corner of Turkey – the area on a map where the coastline stops plunging south and takes a sharp left-turn to the east, an area stunningly beautiful but unsuitable for mass tourism because of its steep topography and lack of sandy beaches. We stayed in a small family-run hotel on a hill overlooking the town of Kalkan; below our balcony snaked small, serpentine streets leading down to the harbor, and beyond that – as if we were perched on the edge of the world – nothing but the crystalline waters of the Mediterranean stretching out to meet the horizon. The sun was shining, the locals friendly, the pace of life relaxed, the cold beers plentiful. There was something deeply, familiarly Mediterranean about the place – but at the same time it was tantalizingly foreign. This foreignness assumed many guises: the distant plaintive wail of the muezzin calling everyone to prayer at the break of dawn; the strange, incomprehensible writing on street signs; the markets, full of haggling and drama and unfamiliar products; the scent of tea and Nargile smoke wafting out from the interior of shops, and of course, in ways more spectacular than we could have dreamed, the food. We both considered ourselves familiar with Turkish food from Germany, where Turkish take-out is as ubiquitous as McDonalds and only sometimes better tasting. In Turkey itself, the food was jaw-dropping. It exploded with freshness and the flavors of sun-ripened fruits, vegetables and herbs. We feasted on chicken stewed with cumin, pomegranate and orange; fish roasted with sumac; eggplant stuffed with spicy lamb and pine nuts; melting tomato salads doused with lemon and fresh dill. We ate rose-petal jam on thick, creamy yogurt for breakfast, candied pumpkin and spoonfuls of honey-soaked pistachios for dessert. We drank tart apple tea, salty yogurt aryan, and tiny glasses of syrupy coffee. And whenever everything looked so good that we simply couldn’t decide what to order, we ate mezze. Dips, salads, vegetables, pastries and meat – mezze are the tapas of the Middle East, small plates that are meant as an appetite stimulant, an antidote to indecision, and an excuse to linger over your meal for hours. In Turkey and other countries of the Eastern Mediterranean they’re cheap, plentiful, and about as authentic as food gets; they’re also one of the easiest ways to recreate a Middle Eastern feast at home. A few fragrant salads, some marinated olives and peppers, some spicy lamb kofte, warm pita bread and these hauntingly delicious dips, and you have a meal fit for a sultan. Though it can’t replace the magic of actually being there again, at least for this there is no last-minute packing required. Note: both of the following can be used as dips for bread, as a sauce for vegetables or as an accompaniment to meat or fish. For best results, make the recipe at least one day in advance. Roast the bell peppers and the chili, if using, over hot coals, a gas burner, or under the broiler in the oven, turning frequently until blackened and blistered all over, about 12 minutes. Place in a covered bowl to steam for ten minutes, then rub off the skins. Slit open the peppers and remove the stems, membranes and seeds. Spread the peppers on paper towels and let drain for at least ten minutes. In a food processor, grind the walnuts, lemon juice, pomegranate molasses, cumin, salt and sugar until smooth. Add the peppers; process until pureed and creamy. With the machine on, add the olive oil in a thin stream. If the paste is too thick, thin with a tablespoon or two of water. Taste and add more pomegranate molasses, salt or sugar to achieve a good balance between sour, sweet and salty. Refrigerate overnight in a covered continer to allow the flavors to blend. Serve at room temperature. In a skillet or oven, heat the nuts until they just start to turn fragrant and golden, watching closely to make sure they don’t burn. Place them in a food processor with the garlic and 1/3 cup of the water; process until smooth. With the machine running, add the bread, vinegar, salt, and the oil; process until well blended. Add the remaining water to loosen the mixture. If a slightly creamier texture is desired, add a couple tablespoons of yogurt. Transfer to a bowl and let mellow for at least two hours before serving, or up to a day. Looking outside my window to a dreary, freezing rain, your descriptions of the sunshine and freshness of Turkey made me positively chartreuse with envy. How gorgeous it all sounds! Maybe a healthy grazing of some mezze will set my mood right tonight. My mouth was watering just looking at your photo, then reading this entry. This is just the kind of food I like to have around when I’m not too hungry but need something to keep body and soul together. One question: pomegranate molasses? I’ve never heard of this. If I can’t find it (I know, hard to believe that in Los Angeles there might be some exotic ingredient that one cannot find…argh), would you or the author of this recipe recommend a -gasp- substitute? Melissa, it was a pleasure to read your post, maybe partly because I am Turkish. Thanks for taking us to different parts of the world.Mari, pomegranate molasses is an ingredient Iranian cuisine also uses. I do not think thst you will have any difficulty finding it in Ca. Melissa, great post. I, too, am of turkish origin and appreciate the kind words about the countryside and the food.As every other Turk, I also have strong opinions about food and have to give my two pence on the subject, hope you don’t mind;-)My family comes from Gaziantep, in the southeast, a major city also considered one of the best cuisines in Turkey. We make muammara (alternative spelling) without garlic and do not bother with skinning the paprika off, either. Instead we add some zwieback (ask Manuel!) and use some more olive oil and lemon juice than you suggest. And also, try to use the turkish red peppers if you can find them, they do taste different. One last word: We never, ever eat muammara as a side to meat or fish. This is strickly a meze, to be eaten with bread! hi melissa, your evocative posts and beautiful pictures never fail to transport me to exotic locales and exciting new tastes – armchair travel at its best!i have wolfert’s book and must confess to never having tried very many recipes beyond the tagines. recently spotted a new title called The Arab Table by May Bsisu that looks pretty promising; have you come across it? Molly, I would highly recommend giving Paula a shot, the woman’s knowledge knows no bounds! I think the main difference between her and Claudia is that Claudia is more geared to making this kind of food ‘accessible’ to as many people as possible, whereas Paula seeks out authenticity, no matter what the cost in terms of do-ability. Of course I would also recommend a trip to Turkey, but failing that, this book is a more than adequate place to start. ;)Hi Tara – Gosh, don’t be envious of me, the weather here is freezing and awful as well! 😉 It does help though, doesn’t it, to be able to conjure up images of sun-drenched places, and even if we’re stuck at home staring at the rain, at least we can travel through our stomachs!Hi Mari – Far be it from me to be the dip Nazi (! ), but I don’t think you could really recreate the same thing without the pomegranate molasses. The thing is, I’m sure you can find it in L.A (I mean, I found it in provincial Edinburgh without any trouble at all). As Zinnur says, it’s a very common ingredient in Turkish and Persian cuisine, and I’ve found that many Indian and Middle Eastern shops carry it as well (where it also might go by the names pomegranate paste, syrup or concentrate). If you really can’t find it but you can find pomegranate juice, I suppose you could approximate it by boiling down the juice until you have a very thick, syrupy sauce. But the flavor it gives is more than worth the trouble of finding it, and a bottle keeps for a long time!Hi Zinnur – Thank you, it’s a pleasure to have someone Turkish reading my site! :)Hi Hande – Your opinions are more than welcome! While we were in Kalkan we met an artist from Gaziantep, and he also told us the cuisine from his hometown is some of the most sophisticated in Turkey. We’ll have to put it on our itinerary next time! I consulted several recipes for the muhammara and was surprised to see that they were all quite different, but many did include, as you say, some sort of bread or crackers and most did not include garlic. I’ll have to try it following your directions next time I make it and see how they compare. And should you have any other favorite recipes to share, I’d be thrilled!Hi J – Thank you! This was actually my first foray in to this particular book, and I certainly haven’t gotten very far as these two recipes are to be found in the first five pages! Despite that, it is my most treasured book on Middle Eastern cuisine, just for the sheer wealth of information in it. I haven’t actually seen the Arab Table, though it seems to get good reviews – let me know if you have a chance to test it out! Hi Melissa, well you’ve made me want to go to Turkey now to taste some of that jaw-dropping food. How do you always seem to find that! The dips sound wonderful and the pine nut one especially peaks my interest because of the bread soaked in water. Sounds kind of weird! But weird in such a way as to make me want to try it! And your picture is again gorgeous. The red of the muhammara is spectacular. OMG that is a gorgeous photo! Your post is evocative as ever. I loved the food in Turkey and I can still remember the big fat hazelnut meringues with which I had a daily dalliance =)Both the dips sound fantastic, the pine nut one especially. Allow it to mellow for two hours? Huh. I don’t think I’d be able to control myself! Hi Melissa, a lovely story and photo again! I’m temporarily sharing a flat with a really nice Turkish couple who are constantly whipping up various delicacies from Turkish kitchen, so I’m almost spoilt for choice these days:) I must ask them to make muhammara and tarator one day!! 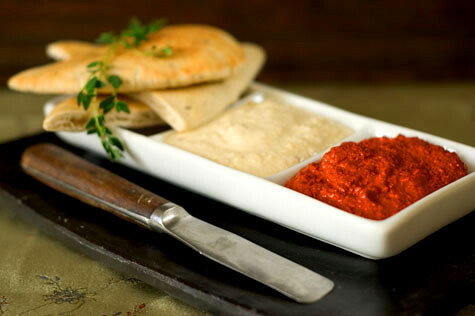 The red pepper, walnut & pomegranate dip is so beautiful- I’m sure it is tasty as well. Perfect for the holidays or any other time, I’m sure. I love this type of food- just something to nibble on with a glass of wine. I will definitely try this- thanks for the recipe and the gorgeous photograph! What a nice surprise–a travel log and food column.That in itself is a delicious pairing. I was looking for the origin of tarator sauce, when I came upon your site. I found my recipe (which does contain garlic and bread, rather than crackers) in Deborah Madison’s wonderful cookbook, Vegetarian Cooking For Everyone. Surprised too not to find THAT one on your bookshelf. If it can stand the weight of another priceless tome, I would recommend this hefty volume. Hi Cynthia – Strangely enough, I’ve given that book as gifts to others, and cooked from it at their houses, but I don’t own a copy myself. Maybe it’s time I remedy that… Hi Sila – Thanks for the tarator tips (hazelnuts sound delicious! ), and yes, Istanbul is definitely on the top of our list. We really loved Turkey, as you can tell! As for the food in Kalkan, I must admit that it wasn’t universally good – of course a couple of more ‘touristy’ places we stumbled into were quite disappointing, but overall the quality and freshness of the food just blew me away (I think above all I was comparing it to Greece, where I was quite underwhelmed by nearly everything…) But I will certainly keep your offer in mind, when we are finally able to arrange that trip to Istanbul! Hi Melissa, I enjoyed your post a lot! I love tarator sauce, I don’t know if you had that in Istanbul but it’s especially good with deep fried breaded mussels and with a glass of ice cold pilsner of course! I’ve had tarator only with walnuts and had no idea that it could be made with pinenuts.Thanks for teaching me something new about my country’s cuisine. Just made muhammara using your recipe as a basis (slightly twisting that to fit local conditions, you know:)). Thank you!And wish you both a very lovely New Year! !